Background: Functional dependence (FD) and vitamin D deficiency are common conditions in older adults. However, little is known about the relationship between FD and serum vitamin D status in centenarians. The current study was designed to evaluate the prevalence of FD and examine its relationship with serum vitamin D status among centenarians in China. Subjects and methods: A cross-sectional study of a large sample of Chinese centenarians including 180 men and 822 women was conducted from June 2014 to December 2016. Home interviews, physical examinations, and blood analyses were performed in 958 centenarians following standard procedures. 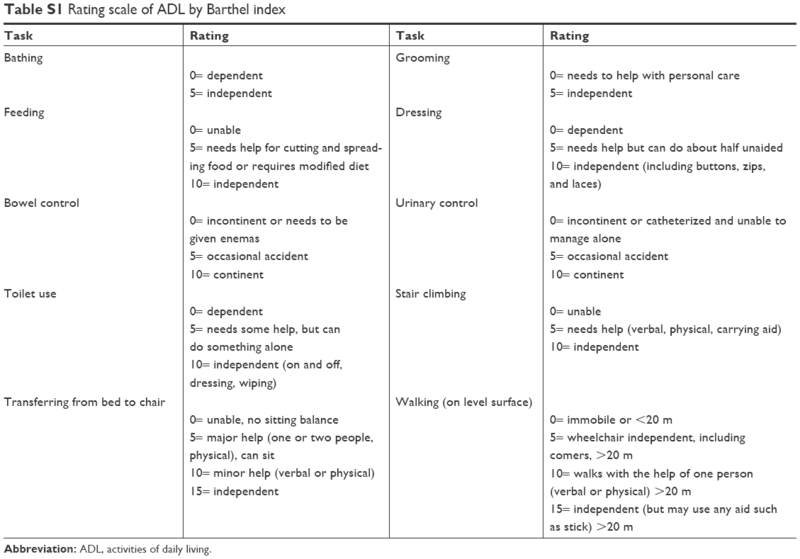 FD was evaluated using the Barthel index of activities of daily living (ADL). Serum 25-hydroxyvitamin D (25OHD) concentrations were measured as a marker of vitamin D status. Results: The prevalence of centenarians with FD was 71.2%. Vitamin D deficiency, lack of tea consumption, lack of outdoor activities, visual impairment, and fracture were predictors of FD. Centenarians in the lowest quartile of serum 25OHD concentration had an approximately threefold greater likelihood of FD than those in the highest quartile in multiple logistic regression models (OR =2.88; 95% CI 1.75–4.73; P<0.001). The multivariable OR with a 1 ng/mL decrease in serum 25OHD concentration was 1.06 (95% CI 1.04–1.08; P<0.001) for FD. Conclusion: Serum 25OHD levels have important associations with FD in Chinese centenarians. Future research could focus on the value of intervening in the case of low serum 25OHD levels through vitamin D supplementation and improving ADL in the older population. As a musculoskeletal risk factor, hypovitaminosis D is very common among older adults worldwide due to the reduced capacity of the skin to produce vitamin D, reduced sunlight exposure caused by less outdoor activity, and impaired nutrition.13–15 Previous studies have investigated the relationship between FD and vitamin D deficiency in older adults.16–18 However, only a few studies with a limited sample size have examined its relationship among the oldest old individuals, and contentious findings have been reported.19,20 In addition, surveys on the relationship between FD and vitamin D levels in centenarians are scarce, especially in developing countries. Considering the high prevalence of vitamin D deficiency and functional decline as people age, the relationship between vitamin D status and functional performance warrants a more focused examination among the oldest old populations including centenarians. For these reasons, the aim of the current study was to investigate the prevalence of FD and to evaluate its relationship with serum 25-hydroxyvitamin D (25OHD) status among a group of population-based centenarians in China. The sample of this study was obtained from the baseline survey of the China Hainan Centenarian Cohort Study (CHCCS), which was conducted in Hainan, China, from 2014 to 2016. Details of this study including sampling strategy and interview procedures have been described elsewhere.21,22 In brief, a total of 1,002 centenarians (180 men and 822 women aged 100 years and over) were interviewed, and blood samples were collected in this study. After excluding 44 participants who failed to provide complete information on physical examinations or blood analyses, 958 subjects (176 men and 782 women) were included in the final analysis. Written informed consent was obtained from all men and women who participated in this study. The ethics committee of the Hainan branch of the Chinese People’s Liberation Army General Hospital (Sanya, Hainan) approved the study protocol (no. of serial: 301hn11201601). Home interviews were conducted to collect data on the demographic details (age, gender, education, marital status, ethnicity, and living arrangements), season of blood collection, lifestyles (smoking, alcohol use, tea consumption, and outdoor activities), and common conditions (hypertension, diabetes, dyslipidemia, visual and auditory impairments, and fractures) of the participants. The ethnic origin was categorized as “Han” (the predominant ethnicity in China) and “non-Han”; the season of blood sampling was dichotomized into summer (April–September) and winter (October–March). The body mass index (BMI) was calculated as the weight in kilograms divided by the square height in meters. Blood samples from each participant were collected, and the plasma parathyroid hormone (PTH) levels were measured using automated electrochemiluminescence immunoassay (ECLIA) analyzers (Hoffman-La Roche Ltd., Basel, Switzerland). Smoking and alcohol use were categorized as “current,” “past,” and “never.” The habits of daily tea consumption and outdoor activities (more than 10 minutes) were divided into “yes” or “no.” Common conditions, including hypertension, diabetes, dyslipidemia, visual impairment, auditory impairment, and fractures, were recorded as self-reported combined with the medical records of the participants. Categorical variables were reported as numbers with percentages, while continuous variables were reported as the mean with SD, and they were compared by Student’s t-test and chi-squared test, respectively. Multiple logistic regression analyses were performed to investigate the independent factors related to FD. To examine its relationship with functional dependency, serum 25OHD concentrations were further categorized into quartiles (lowest, <16.3 ng/mL; second, 16.4–21.5 ng/mL; third, 21.6–28.0 ng/mL; and highest, >28.1 ng/mL). Differences of the Barthel index score and the sum of dependent items of ADL among four groups according to the quartiles of serum 25OHD levels were evaluated using one-way ANOVA and linear polynomial contrast analyses. To elucidate the level of serum 25OHD associated with FD, logistic regression analyses were used to evaluate the odds of FD according to the quartiles of the serum 25OHD concentrations and a 1 ng/mL decrease in serum 25OHD concentrations with multiple adjustments for potential confounders. P for trend was evaluated by entering FD in the model as a ranked variable. A P-value of <0.05 was considered statistically significant. All analyses were carried out using SPSS software (version 19.0 for windows, no. of serial: 5087722; IBM Corporation, Armonk, NY, USA). The study sample included 782 women (81.6%) and 176 men (18.4%) with the mean age of 102.8 years. The prevalence of FD and vitamin D deficiency in the total sample was 71.2% and 39.7%, respectively. It was observed that 74.0% of women and 58.5% of men were functionally dependent (P<0.001), and 80.0% of participants with vitamin D deficiency and 65.4% without vitamin D deficiency had FD (P<0.001). Table 1 summarizes the characteristics of participants with and without FD. The participants with FD had significantly lower values of serum 25OHD concentrations (21.7±9.5 vs 25.3±8.8 ng/mL; P<0.001) than those without FD. Subjects who were female, were illiterate, lived with family members, were evaluated in winter, were vitamin D deficient, had a higher PTH concentration, participated in less outdoor activities, had visual or auditory impairment, and suffered a fracture were more likely to be functionally dependent (P<0.05). Alcohol use and tea consumption were more common in functionally independent participants (P<0.05). 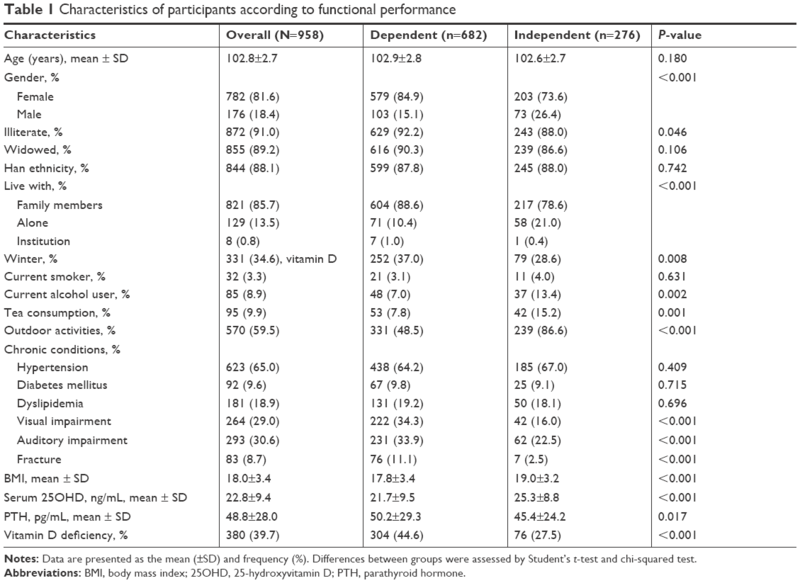 Multiple logistic regression analyses revealed that vitamin D deficiency, tea consumption, outdoor activities, visual impairment, and fracture were significant factors related to FD in this population (Table 2). In addition, the participants with vitamin D deficiency have higher odds of dependence in eight functional items (including grooming, bathing, toilet use, dressing, feeding, stair climbing, transferring from bed to chair, and walking) than those without vitamin D deficiency (Table S2). Notes: Data are presented as the mean (±SD) and frequency (%). Differences between groups were assessed by Student’s t-test and chi-squared test. Abbreviations: BMI, body mass index; 25OHD, 25-hydroxyvitamin D; PTH, parathyroid hormone. Notes: All the significantly different variables were included in the multivariate logistic regression model. Only significant predictive variables of FD are presented. After participants were categorized into four groups according to the quartiles of serum 25OHD concentrations, an elevated trend of the Barthel index score (ranging from 64.6 in the lowest quartile to 82.5 in the highest quartile, P for trend <0.05) and a decreased trend of the sum of dependent ADL items (ranging from 4.8 in the lowest quartile to 2.6 in the highest quartile, P for trend <0.05) were observed. The trends remained constant after the stratification of participants by gender (Figure 1). 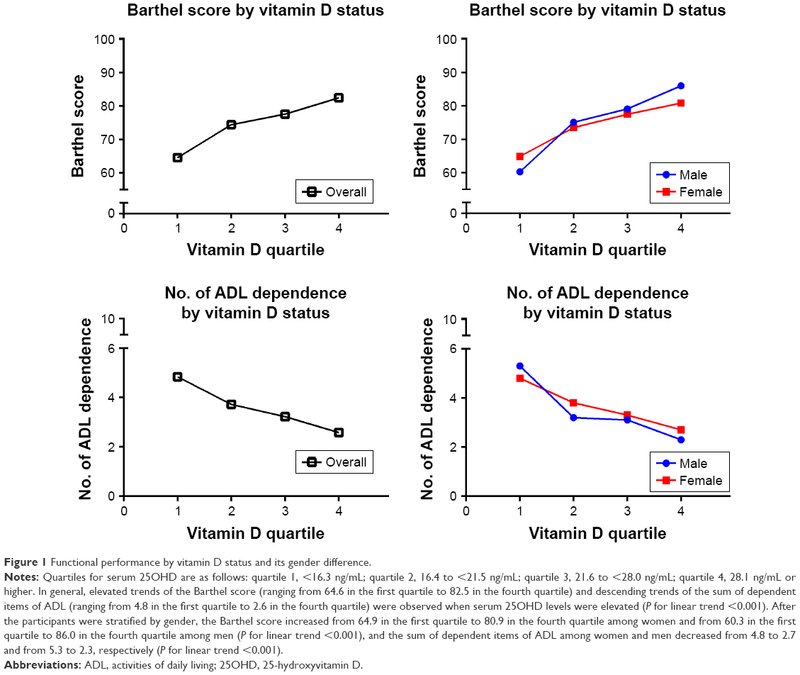 Figure 1 Functional performance by vitamin D status and its gender difference. Notes: Quartiles for serum 25OHD are as follows: quartile 1, <16.3 ng/mL; quartile 2, 16.4 to <21.5 ng/mL; quartile 3, 21.6 to <28.0 ng/mL; quartile 4, 28.1 ng/mL or higher. In general, elevated trends of the Barthel score (ranging from 64.6 in the first quartile to 82.5 in the fourth quartile) and descending trends of the sum of dependent items of ADL (ranging from 4.8 in the first quartile to 2.6 in the fourth quartile) were observed when serum 25OHD levels were elevated (P for linear trend <0.001). After the participants were stratified by gender, the Barthel score increased from 64.9 in the first quartile to 80.9 in the fourth quartile among women and from 60.3 in the first quartile to 86.0 in the fourth quartile among men (P for linear trend <0.001), and the sum of dependent items of ADL among women and men decreased from 4.8 to 2.7 and from 5.3 to 2.3, respectively (P for linear trend <0.001). 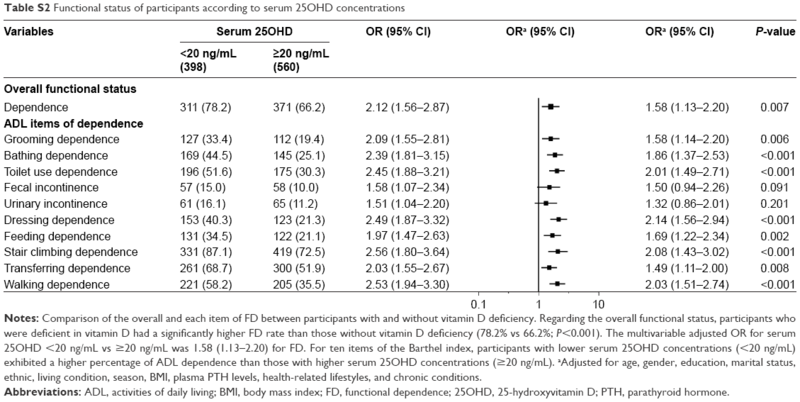 Abbreviations: ADL, activities of daily living; 25OHD, 25-hydroxyvitamin D.
Table 3 summarizes that the adjusted OR for the lowest vs highest quartile of serum 25OHD levels was 2.88 (1.75–4.73), and the adjusted odds of FD when comparing the second and third quartiles with the highest quartile were 1.91 (1.23–2.96) and 1.36 (0.90–2.07), respectively (P for trend <0.001). In addition, the multivariable adjusted OR with a 1 ng/mL decrease in serum 25OHD levels was 1.06 (1.04–1.08, P<0.001). Notes: Serum 25OHD levels were categorized into quartiles. Model 1: unadjusted; Model 2: adjusted for age, gender, education, marital status, ethnicity, and living conditions; Model 3: further adjusted for season of sample collecting, BMI, plasma PTH levels, smoking, alcohol use, tea drinking, outdoor activities, and chronic conditions (hypertension, diabetes, dyslipidemia, visual and auditory impairments, and fractures). *P<0.001; **P<0.05. Abbreviations: BMI, body mass index; FD, functional dependence; 25OHD, 25-hydroxyvitamin D; PTH, parathyroid hormone. In this study, we observed an association between serum 25OHD levels and FD in a population-based sample of Chinese centenarians in Hainan province. Low serum 25OHD levels were associated with an increased prevalence of FD, and this association remained unchanged after adjusting for demographics and other potential confounders. Based on this Chinese study with a relatively large sample size, we added to the evidence of the association between vitamin D status and FD among extremely longevous people. Several studies have shown an association between low serum vitamin D levels and FD among older individuals in developed countries such as USA and Japan.16,18 To the best of our knowledge, this is the first study to specifically focus on the relationship between FD and serum 25OHD levels in a representative sample of centenarians from a developing country. The maintenance of physical function in old age is an important factor not only for a healthy and independent life in the community but also for preventing disability and early mortality.9,29 The current population-based study reported that nearly 3/4 of centenarians were functionally dependent; in other words, these subjects exhibited a decline in physical function and required help in the basic ADL. The finding is consistent with that of previous studies that have reported that the prevalence of FD among centenarians was 81% in Japan,30 76% in the USA,31 67% in Poland,9 and 61% in Australia.32 However, a lower dependence rate of 53% was observed in Denmark.33 Despite the controversy surrounding this concept, it was observed that centenarians who were functionally dependent were more likely to have 1-year mortality at a rate of 11.1% compared to those who were not;9 further effective interventions should be addressed among this population with FD. Several observational studies have reported associations between functional declines with lower serum 25OHD levels.16,48 In addition, a few randomized control trials have shown evidence that vitamin D supplementation improves functional performance.17,49 Thus, maintaining adequate vitamin D levels or the intake of vitamin D supplements among the very old may potentially help to prevent declines in physical function and preserve good ADL.18,19 Considering the low cost of vitamin D supplements and the lack of habitual intake of vitamin D supplementation among the elderly population in China, it is critical to closely examine the association between vitamin D levels and the preservation or improvement in physical function in this population. As there is little knowledge on FD and limited data on the relationship between functional decline and vitamin D status among the very old in developing countries, our data provide novel insights into the nature of this relationship among a representative sample of centenarians in China. Nevertheless, the study has some potential limitations. First, our results do not indicate any causal inferences due to the cross-sectional design, and additional cohort studies with follow-up data are essential to strengthen the evidence. Second, other factors such as cognitive impairment and psychological situations were not included in this study, and hence, potential confounders may remain unrecognized. Third, the data on chronic conditions were based on self-reported data; thus, the subjectivity derived from it should also be acknowledged in this study. This study reports that FD is common in a population-based sample of centenarians in China, and serum 25OHD levels were independently and inversely associated with FD in this extremely longevous population. Future research could focus on the value of intervening in the case of low serum 25OHD levels through vitamin D supplementation and improving ADL in older populations. We appreciate all the staff of the Hainan Centenarian Study for their continued cooperation and contribution to the field work. This study was supported by grants from the National Natural Science Foundation of China (81371561, 81773502) and the Key Research and Development Program of Hainan (ZDYF2016169, ZDYF2017095, and ZDYF2017126). The sponsors had played no role in the design, conduct, interpretation, review, approval, or control of this article. Portegijs E, Rantakokko M, Viljanen A, Sipilä S, Rantanen T. Identification of Older People at Risk of ADL Disability Using the Life-Space Assessment: A Longitudinal Cohort Study. J Am Med Dir Assoc. 2016;17(5):410–414. Black SA, Rush RD. Cognitive and functional decline in adults aged 75 and older. J Am Geriatr Soc. 2002;50(12):1978–1986. Yao Y, Fu S, Zhang H, et al. The prevalence of depressive symptoms in Chinese longevous persons and its correlation with vitamin D status. BMC Geriatr. 2018;18(1):198. Lyu W, Wolinsky FD. The Onset of ADL Difficulties and Changes in Health-Related Quality of Life. Health Qual Life Outcomes. 2017;15(1):217. Bruce DG, Paley GA, Nichols P, Roberts D, Underwood PJ, Schaper F. Physical disability contributes to caregiver stress in dementia caregivers. J Gerontol A Biol Sci Med Sci. 2005;60(3):345–349. Samus QM, Mayer L, Onyike CU, et al. Correlates of functional dependence among recently admitted assisted living residents with and without dementia. J Am Med Dir Assoc. 2009;10(5):323–329. Lunney JR, Lynn J, Foley DJ, Lipson S, Guralnik JM. Patterns of functional decline at the end of life. JAMA. 2003;289(18):2387–2392. Visnjevac O, Lee J, Pourafkari L, Dosluoglu HH, Nader ND, Kritchevsky S. Functional capacity as a significant independent predictor of postoperative mortality for octogenarian ASA-III patients. J Gerontol A Biol Sci Med Sci. 2014;69(10):1229–1235. Mossakowska M, Broczek K, Wieczorowska-Tobis K, et al. Cognitive performance and functional status are the major factors predicting survival of centenarians in Poland. J Gerontol A Biol Sci Med Sci. 2014;69(10):1269–1275. Daly RM, Rosengren BE, Alwis G, Ahlborg HG, Sernbo I, Karlsson MK. Gender specific age-related changes in bone density, muscle strength and functional performance in the elderly: a-10 year prospective population-based study. BMC Geriatr. 2013;13:71. Singh DK, Manaf ZA, Yusoff NA, Muhammad NA, Phan MF, Shahar S. Correlation between nutritional status and comprehensive physical performance measures among older adults with undernourishment in residential institutions. Clin Interv Aging. 2014;9:1415–1423. Hilger J, Friedel A, Herr R, et al. A systematic review of vitamin D status in populations worldwide. Br J Nutr. 2014;111(1):23–45. Holick MF, Chen TC. Vitamin D deficiency: a worldwide problem with health consequences. Am J Clin Nutr. 2008;87(4):1080S–1086S. Cabral MA, Borges CN, Maia JM, Aires CA, Bandeira F. Prevalence of vitamin D deficiency during the summer and its relationship with sun exposure and skin phototype in elderly men living in the tropics. Clin Interv Aging. 2013;8:1347–1351. Sohl E, van Schoor NM, de Jongh RT, Visser M, Deeg DJ, Lips P. Vitamin D status is associated with functional limitations and functional decline in older individuals. J Clin Endocrinol Metab. 2013;98(9):E1483–E1490. Zhu K, Austin N, Devine A, Bruce D, Prince RL. A randomized controlled trial of the effects of vitamin D on muscle strength and mobility in older women with vitamin D insufficiency. J Am Geriatr Soc. 2010;58(11):2063–2068. Kojima G, Tamai A, Masaki K, et al. Prevalence of vitamin D deficiency and association with functional status in newly admitted male veteran nursing home residents. J Am Geriatr Soc. 2013;61(11):1953–1957. Haslam A, Johnson MA, Hausman DB, et al. Vitamin D status is associated with grip strength in centenarians. J Nutr Gerontol Geriatr. 2014;33(1):35–46. Matheï C, van Pottelbergh G, Vaes B, Adriaensen W, Gruson D, Degryse JM. No relation between vitamin D status and physical performance in the oldest old: results from the Belfrail study. Age Ageing. 2013;42(2):186–190. He Y, Zhao Y, Yao Y, et al. Cohort Profile: The China Hainan Centenarian Cohort Study (CHCCS). Int J Epidemiol. 2018;47(3):694–695. Yao Y, Chen X, Wu S, et al. Thyroid nodules in centenarians: prevalence and relationship to lifestyle characteristics and dietary habits. Clin Interv Aging. 2018;13:515–522. Leung SO, Chan CC, Shah S. Development of a Chinese version of the Modified Barthel Index – validity and reliability. Clin Rehabil. 2007;21(10):912–922. Quinn TJ, Langhorne P, Stott DJ. Barthel index for stroke trials: development, properties, and application. Stroke. 2011;42(4):1146–1151. van Hartingsveld F, Lucas C, Kwakkel G, Lindeboom R. Improved interpretation of stroke trial results using empirical Barthel item weights. Stroke. 2006;37(1):162–166. Zerwekh JE. Blood biomarkers of vitamin D status. Am J Clin Nutr. 2008;87(4):1087S–1091S. Scott WK, Macera CA, Cornman CB, Sharpe PA. Functional health status as a predictor of mortality in men and women over 65. J Clin Epidemiol. 1997;50(3):291–296. Ozaki A, Uchiyama M, Tagaya H, Ohida T, Ogihara R. The Japanese Centenarian Study: autonomy was associated with health practices as well as physical status. J Am Geriatr Soc. 2007;55(1):95–101. Jopp DS, Park MK, Lehrfeld J, Paggi ME. Physical, cognitive, social and mental health in near-centenarians and centenarians living in New York City: findings from the Fordham Centenarian Study. BMC Geriatr. 2016;16(1):1. Richmond RL, Law J, Kay-Lambkin F. Physical, mental, and cognitive function in a convenience sample of centenarians in Australia. J Am Geriatr Soc. 2011;59(6):1080–1086. Andersen-Ranberg K, Schroll M, Jeune B. Healthy centenarians do not exist, but autonomous centenarians do: a population-based study of morbidity among Danish centenarians. J Am Geriatr Soc. 2001;49(7):900–908. Srikuea R, Zhang X, Park-Sarge OK, Esser KA. VDR and CYP27B1 are expressed in C2C12 cells and regenerating skeletal muscle: potential role in suppression of myoblast proliferation. Am J Physiol Cell Physiol. 2012;303(4):C396–C405. Mozos I, Stoian D, Luca CT. Crosstalk between Vitamins A, B12, D, K, C, and E Status and Arterial Stiffness. Dis Markers. 2017;2017(2):8784971. Wang TJ, Pencina MJ, Booth SL, et al. Vitamin D deficiency and risk of cardiovascular disease. Circulation. 2008;117(4):503–511. Caraba A, Crişan V, Romoşan I, Mozoş I, Murariu M. Vitamin D Status, Disease Activity, and Endothelial Dysfunction in Early Rheumatoid Arthritis Patients. Dis Markers. 2017;2017(8). Mary A, Hénaut L, Boudot C, et al. Calcitriol prevents in vitro vascular smooth muscle cell mineralization by regulating calcium-sensing receptor expression. Endocrinology. 2015;156(6):1965–1974. Cantorna MT, Zhu Y, Froicu M, Wittke A. Vitamin D status, 1,25-dihydroxyvitamin D3, and the immune system. Am J Clin Nutr. 2004;80(6 Suppl):S1717–S1720. Matchar DB, Chei CL, Yin ZX, et al. Vitamin D Levels and the Risk of Cognitive Decline in Chinese Elderly People: the Chinese Longitudinal Healthy Longevity Survey. J Gerontol A Biol Sci Med Sci. 2016;71(10):1363–1368. Dickens AP, Lang IA, Langa KM, Kos K, Llewellyn DJ. Vitamin D, cognitive dysfunction and dementia in older adults. CNS Drugs. 2011;25(8):629–639. Kalueff AV, Eremin KO, Tuohimaa P. Mechanisms of neuroprotective action of vitamin D(3). Biochemistry. 2004;69(7):738–741. Kesby JP, Eyles DW, Burne TH, McGrath JJ. The effects of vitamin D on brain development and adult brain function. Mol Cell Endocrinol. 2011;347(1–2):121–127. Holick MF. Vitamin D: importance in the prevention of cancers, type 1 diabetes, heart disease, and osteoporosis. Am J Clin Nutr. 2004;79(3):362–371. Clemens TL, Zhou XY, Myles M, Endres D, Lindsay R. Serum vitamin D2 and vitamin D3 metabolite concentrations and absorption of vitamin D2 in elderly subjects. J Clin Endocrinol Metab. 1986;63(3):656–660. Houston DK, Neiberg RH, Tooze JA, et al. Low 25-hydroxyvitamin D predicts the onset of mobility limitation and disability in community-dwelling older adults: the Health ABC Study. J Gerontol A Biol Sci Med Sci. 2013;68(2):181–187. Janssen HC, Samson MM, Verhaar HJ. Muscle strength and mobility in vitamin D-insufficient female geriatric patients: a randomized controlled trial on vitamin D and calcium supplementation. Aging Clin Exp Res. 2010;22(1):78–84. Abbreviation: ADL, activities of daily living. Notes: Comparison of the overall and each item of FD between participants with and without vitamin D deficiency. Regarding the overall functional status, participants who were deficient in vitamin D had a significantly higher FD rate than those without vitamin D deficiency (78.2% vs 66.2%; P<0.001). The multivariable adjusted OR for serum 25OHD <20 ng/mL vs ≥20 ng/mL was 1.58 (1.13–2.20) for FD. For ten items of the Barthel index, participants with lower serum 25OHD concentrations (<20 ng/mL) exhibited a higher percentage of ADL dependence than those with higher serum 25OHD concentrations (≥20 ng/mL). aAdjusted for age, gender, education, marital status, ethnic, living condition, season, BMI, plasma PTH levels, health-related lifestyles, and chronic conditions. Abbreviations: ADL, activities of daily living; BMI, body mass index; FD, functional dependence; 25OHD, 25-hydroxyvitamin D; PTH, parathyroid hormone.